What can I say? I'm all about the multitasking, even for hats. This 1920s cloche works with hair and without it, protects curls or conceals the lack of them, and looks stylish whether or not the softer stocking stitch is worn in by a girl who's having treatment. NOTE: for some reason I have yet to identify and fix, some people are having trouble downloading this pattern. If you turn out to be one of them, just e-mail me and I'll send it to you directly. Thanks! I love this hat! Thanks for sharing!! Unfortunately I don't, Dottie :^( I've e-mailed you some notes on the hat that might help you adapt it! Good luck and best wishes, Dee! And I hope all your hats are super comfy and fun to wear. Thank you for the lovely pattern. I can't wait to make it. Oerfect! My colleague and friend is beginning chemo. She will look precious in this hat. I will get out my needles. Thank you so much. cloche. I think this is it. I going shopping tomorrow morning for yarn. can't seem to email or get pattern could you post a different link love the pattern. thanks. Could you please email this pattern to me. I have a dear friend who has bilateral breast cancer and I would love to make several of these for her. Nonnie, if you're not able to download the file from the link, please do e-mail me at the address mentioned above in these comments - I'll be glad to send you this pattern! I'm excited to get started on this for a friend who deserves a little style while in the hospital. Her head measures 23 1/2 as a headband measurement. Can I assume that would be a Medium? I can't seem to find a chart that makes the SML aspect clear to me. Thanks for a response and the cute pattern! Diana, you're so nice to make something for your friend! In the 'Notes' section of the pattern's left column there are size ranges, and I think I would make an L for 23.5". Do a gauge swatch though - if you substitute yarn that is super elastic (the Malabrigo isn't so much) you might get away with an M. Hope your friend's better very soon! I've always loved the flirty look of the cloche. Thank you. I can't wait to get some wool to work this. Thank you so much for this pattern. A dear friend of mine just started chemo last week and I've been looking for a cute hat to make for her. This has her personality all over it! I love the look of this pattern! Definitely gonna give this a try. Can this be knitted in the round? Hello, I don't know if you will see this, but would you be willing to try and convert the pattern quickly to a flat pattern? I don't have circular needles and my aunt deserves such a pretty hat. Hannah, because the hat starts off flat anyway it's pretty straightforward - just don't bother joining it after the brim, and purl every other row till you get to the nine remaining stitches which you can finish as written, then stitch down the open side. The neatest way though would be to cast on 2 extra stitches for the brim for a border to sew through. On every row just slip the first, knit the last, and work the rest as written. You'll see what I mean after a few rows - makes a nice clean edge. Hope that helps! If people click on the down load then click open on the bottom when it comes up you'll be able to download to adobe reader, that is if you have it. Hope this helps. Thanks so much for pointing this out, Anon! I just finished a little top down hat and used your split brim idea... how brilliant! Mine has a contrasting frill knitted along the edge of the brim for a bit of whimsy, but I like the cloche shape so much, I just might make another with a more classic look. Also, for a removable adornment, I decided to use a lovely brooch, so I can change it up as I please. Thanks for this great pattern. Do you have a version of this hat in DK weight? I'm about to start chemo (again?) and would like something a little lighter than worsted. Thanks. Oh Tobi, I am so sorry to hear you have to do a repeat of your chemo! You might try my Asymmetrical Cloche - it's a similar style of pattern written a sport weight or a little heavier (I used organic cotton). 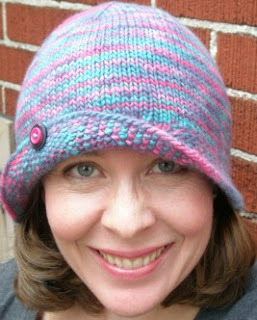 On my Free Patterns tab there are several chemo-friendly hats marked with an asterisk. Hope you find something that suits! This is a wonderful pattern! Is it possible to knit it in smaller sizes, decreasing in multiples of ??? Anonymous, I'm pretty sure it's multiples of 9 for the crown, but your problem would be with the brim which was very complex to write out! Maybe you could try knitting the smallest size with a slightly smaller yarn and needle to scale it down a bit more? I am halfway thru chemo and this hat is ideal for my "hair thinning"... I am having trouble downloading it though...would you please email it to me..
Tracey I would be so glad to e-mail the pattern to you! If you click on my e-mail link at the right side bar on the web page, you can send me a note with your address and I'll get it right over. Just wondering if you might be able to suggest a yarn that has silk in it or a cotton yarn for this hat? I love Malbrigo but it is summer right now and the woman who will be getting this hat is having chemo within the next month. I don't really know much about chemo and when people lose their hair. Audrey, try Lion Cotton Solid, by Lion Brand. It's an Aran weight 100% cotton yarn that might do. And check out my Asymmetrical Cloche pattern - there's a variation in that one for an undyed organic cotton that might be useful. You have to be careful subbing in different fibers for a pattner but Malabrigo acts a lot like cotton or silk, sagging out over time instead of stretching and snapping back into shape like other wools. When a friend of mine needed chemo in the summer I made her an Asymmetrical Cloche in cotton for daytime, and a Bobcap in superwash wool for nights. Your head gets really cold without hair and at night, a hat that holds in some body heat is a true comfort. All the best for your friend's treatment!! I'm having difficulty downloading the pattern. Jackie, send me an e-mail to the address in the right sidebar, and I'll reply with the pattern - no problem! Lynn, if you e-mail me at the address in the column on the right, I will send it to you directly. Sorry about the download problem! I'm a fairly new knitter but I do understand the stiches for this hat. My problem comes when the pattern sequence seems to bounce around. I get busy knitting the one row and then I realize that in the process I've skipped over a row or I've not been on the right row at all. Could you or someone help me rewrite the pattern in the sequence order so I don't miss a row? It is a lovely hat. I really want to make it the correct way. Any suggestions on how to follow the pattern easier? Sorry Unknown - I don't know crochet well enough to make patterns with it! Whoops - thanks for catching that! Mary, I am having serious problems with this brim. On Row 3, you say to P2 tog. Fine, then there should be four less stitches in the next row. That would make it (18 times) the pattern. Is it 18 or is it supposed to be 19? Then I get to slipping 2, * x more times, and the stitches just do not add up. Either way, 18 or 19 the number of stitches I have is wrong. is there supposed to be a column of straight knit (or purl depending on how you look at it)? If so, how to they line up when the stitch count is off? I have taken this back twice already. I don't want to do it again. However, my transitions from row 4 to 5 just don't work. This hat is really cut and I want to make it, but I cannot get past row 5. Grammy Sue, I wonder if you could e-mail me using the address near the bottom of the sidebar so we can work this through in more detail? I need to know what size you are making and also to clarify which row is giving you trouble (row 3 does not have P2tog.) Thanks!